The Christmas tree that stands so beautiful and tall, adorned with ornaments as old as I am . . . belonged to my beautiful mom (1933~2010). 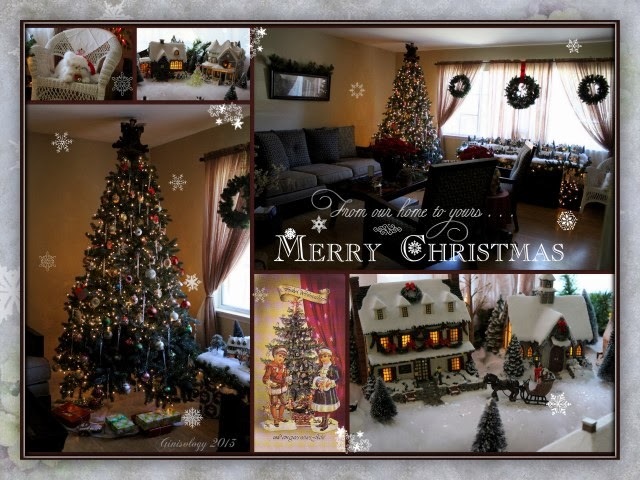 I was blessed to inherit her family room tree (she always had two artificial trees standing in her home) and ornaments. The furry little kitty (who is not real) laying on mom's wicker chair, always hung out in my mom's office . . . he's now comfy in my home and enjoying Christmas Day. I also inherited mom's Thomas Kinkade Christmas Village collection . . . it's a beautiful village and each time I look at it . . . I smile and mom and all the memories warm my heart and I know she is here with our family. Merry Christmas Gini, may your blessings be full of Love and joy. Wishing you and yours a very Blessed Christmas . . . sending you hugs.